Some friends came into town to celebrate birthdays and another pal recommended PERENNIAL VIRANT. I dropped a note about the celebration via Open Table and they couldn’t have been nicer about it– they wished us a happy birthday upon arrival and gave us a great table. 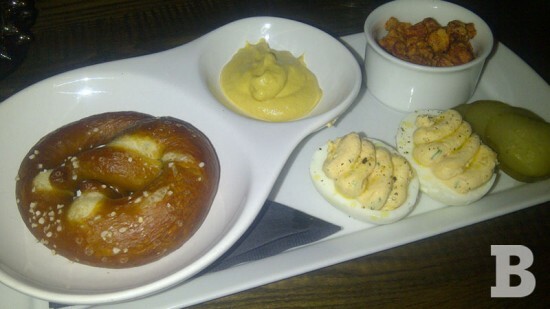 We started off by sharing the “bar snacks” (shown above) – deviled eggs, dill pickles, spicy corn nuts and a soft pretzel with smoked cheddar sauce. This was followed by the best mushroom soup I’ve ever had. And for entrees we ordered the pork cutlet with grilled mushrooms and garlic-mustard chimichuri; the Q7 dry-aged strip loin with mustard vinaigrette and the roasted chicken. All delicious.